Cruise passengers visiting Cowes can select from a wonderful array of shoreside and water-based excursions, organised by the visiting cruise line's shoreside tour services provider. 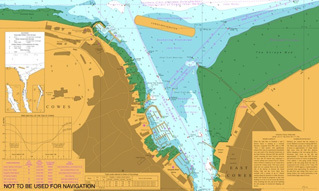 • View and download a medium res PDF of the "Excursions from Cowes" leaflet. 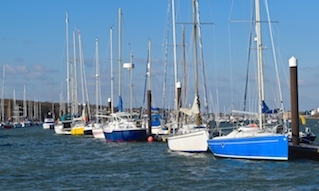 After alighting at Trinity Landing in the heart of Cowes, enjoy the delights and history of “the home of world yachting” with a friendly local guide to lead the way. Sailing and racing are words that are synonymous with Cowes; from the early 1800s the Isle of Wight has hosted 'Cowes Week', the oldest sailing regatta in the world. Attended by Royalty and Olympian champions, the Yacht Clubs of Cowes host multiple member-only events throughout the year. 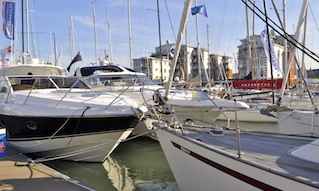 This tour allows you exclusive access to a private Yacht Club where you will gain a historical insight to fully appreciate the rich sailing heritage of Cowes. Afterwards, a stroll along The Parade and through the town’s High Street leads you to the remarkable Sir Max Aitken Museum, located in an 18th century sail maker’s loft, and filled with unique nautical memorabilia. 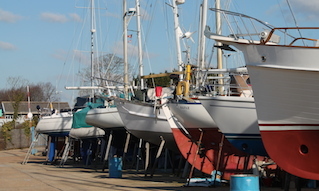 You will stop for a visit, learning about Cowes' incredible maritime history. Many artefacts on view here were saved from Britannia, King George V's Royal Yacht, along with numerous other fascinating historical gems. Alternatively, your guide may take you to the Classic Boat Museum, which boasts over 50 yachts, motor and lifeboats on display including the 2017 British America's Cup Challenge foiling catamaran test boat. A visit to Cowes would not be complete without a taste of artisan foods freshly made on the Island. The Isle of Wight is home to many award winning farms and these local producers supply the independent shops and cafés lining the town’s main streets. Your guide will introduce you to a shopkeeper who has prepared local cheeses and regional wines for you to enjoy in a private courtyard. Any remaining time can be used to explore Cowes' atmospheric and exciting High Street. The refreshingly individual and eclectic shops and galleries yield some great buys before you head back to The Parade. Meet your experienced local cycle guide at The Parade and gear up with a bicycle and helmet. Set off on a leisurely bike ride through Cowes, passing along the High Street. You will take a ride on the Chain Ferry, an unusual and interesting floating bridge, and make your way over the River Medina to East Cowes. Admire the views back towards West Cowes from the seafront, where you will be able to identify landmarks such as the world famous Royal Yacht Squadron. St Mildred's Church in Whippingham village, rich in royal history and heritage, offers wonderful architecture and excellent views. The Church was designed by Prince Albert and frequented by Queen Victoria when she holidayed on the Isle of Wight. Continue to Newport via picturesque country lanes and cycle paths, admiring the stunning rural views of the Medina Valley. The quaint streets of Cowes lead you back to the vibrant High Street, The Parade and the Trinity Landing tender pontoons. Walk along the Trinity Landing tender pontoons to meet your RIB and the friendly crew. After an essential safety briefing and demonstration of safety equipment, step aboard and head out on a scenic tour along the picturesque Isle of Wight coastline. Your skipper shares his/her outstanding local knowledge and provides a commentary on the landmarks and areas of natural beauty you will see along the route. 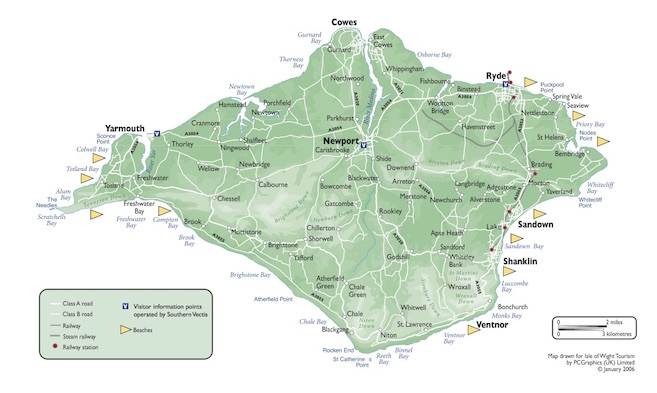 Watch out for Gurnard Bay, beautiful Newton Creek, picturesque Yarmouth Harbour, Colwell Bay and Alum Bay. Your destination is The Needles, a distinctive cluster of three stacks of chalk that rise vertically almost 100 feet out of the sea. The impressive Needles Lighthouse stands boldly at the end of the outermost chalk stack where the weather sweeps in from the west. Some stunning photo opportunities are found here before you make the return journey along the coast back to Cowes. Green thumbs and garden lovers, come to the Ventnor Botanic Gardens to better understand the English world of flora and horticulture. Benefiting from the micro-climate of the Undercliff, Ventnor sits in a prime position to grow and showcase subtropical and exotic plants interacting with each other as they would in the wild. This immersion landscape showcases 30,000 rare plants and trees as they would be seen in their native environments. Ventnor's uniquely mild climate and sheltered setting creates the opportunity to display plants spread across 22 acres of garden. The planting groups are based on geographical regions. A guided garden visit introduces you to the various parts of the garden and offers additional insights. Robert Thompson is the UK’s youngest chef to be awarded a Michelin Star, giving him a platform to promote his own style, ideas and talent amongst the culinary world. Robert’s award winning restaurant, thompson’s, in the Island’s capital of Newport serves contemporary British cuisine in an open kitchen concept. If you are looking to pick up some tips and add to your culinary repertoire then this is for you! Drawing on Robert’s fresh and experienced approach, you will get to see how different dishes are put together using fresh local produce. Suitable for everyone from complete beginners to budding master chefs, these relaxed demonstrations will guide you through different techniques that Robert uses. Each demonstration starts with a coffee and catch up in the bar where Robert will talk you through what he is cooking, then as the demo comes to a close you will enjoy refreshments and a three course set lunch. Don’t worry about the recipes, as you’ll receive a recipe card covering the day. Amazing Carisbrooke Castle, of Saxon origin, was built as one of the fortified camps intended to defend England against the Vikings. The Normans, in turn, came along looking for a spot on which to establish their own stronghold. They found that the stone-faced Saxon fortifications provided them with an excellent ready-made type of defence system, perfect for when one is conquering a bitter and resentful local population. For more than 800 years, the living heart of the castle was enclosed within the Norman curtain walls with a gatehouse. The castle was comprised of internal domestic buildings and the outer bailey. Today, you will explore this romantic castle and its Edwardian-style garden, taking in the panoramic views from atop the high castle walls. Place yourself at the very heart of the Isle of Wight's history in Carisbrooke's Princess Beatrice Garden. "It is impossible to imagine a prettier spot," said Queen Victoria of Osborne House, her palatial holiday home on the Isle of Wight. Queen Victoria and Prince Albert purchased Osborne House with their own money in 1845. The Prince supervised the construction, landscaping and all alterations very closely over the next six years. It was to be a country retreat where the royal family could be free from state ceremonial obligations. Osborne's location, relatively convenient to London, is also quite secluded. A private beach allowed the Queen to swim and enjoy boating with her family. Today, the house and its 350-acre estate allow visitors like you a rare and intimate glimpse into Queen Victoria's family life. You will see the ornate furnishings and artefacts from The Royal Collection that fill the state rooms where Queen Victoria entertained heads of state, inventors, princes and princesses and ruled the vast British Empire. Take some time to enjoy the rest of the estate, exploring the extensive terraces and sweeping lawns, and enjoy the magnificent views out to sea as you head towards Queen Victoria’s private beach. Travel by classic vintage vehicle and experience a step back in time as we enjoy the most scenic parts of the Island. Throughout your journey your local driver will share an insight into Island life as you stop to witness many local points of interest along the route. This tour offers a rare opportunity to learn about the Island's unique history as you stop at special areas of interest and meet local historians; some places a well-kept secret off the tourist map. Quaint villages and rolling hillsides blend together as you then head to Calbourne Watermill, an operating mill since 1066; here you will enjoy local refreshments at this ancient site. Your driver will then continue to guide you across the Island for your return journey to Cowes, allowing you the opportunity to enjoy free time to wander the vibrant Cowes High Street or return directly to the ship's tender point on Trinity Landing, off The Parade. • Shoreside Tour Operators: Contact us at Cowes Harbour Office for more information.